Select Size 25 oz. 64 oz. 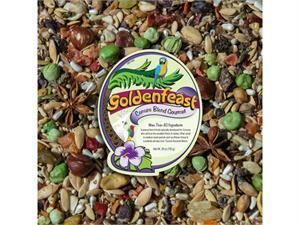 Your small to medium birds will go crazy for more than 40 ingredients specially blended for just for them! 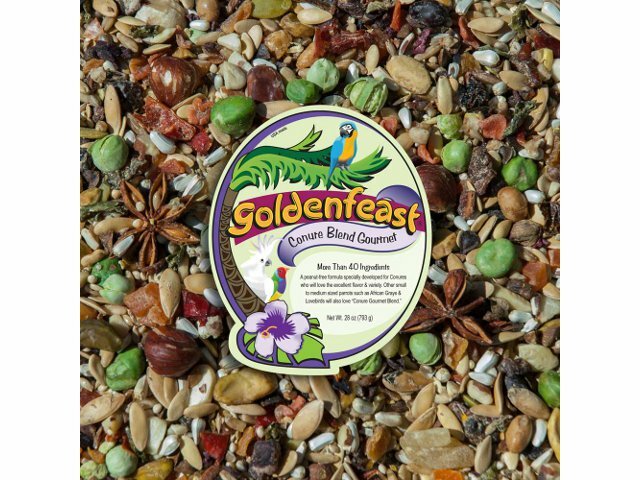 Ingredients: Hulled oats, safflower seed, canary grass seed, whole cantaloupe seed, buckwheat, white proso millet, granola made with rolled oats, whole wheat, brown sugar, canola oil, natural coconut, sweet dairy whey, oat flour, roasted almonds and honey, roasted corn, shelled raw pistachios, roasted cashews, non-roasted sunflower kernels, roasted almonds, red and green sweet peppers, pepitas, cooked and dehydrated chicpeas, sweet potatoes and cooked assorted beans, beets, cranberries, whole star anise seed, papaya and pineapple, sterile hemp seed, carrots and blueberries, goji berries and soy nuts, whole bee pollen, tomatoes, freeze-dried sweet garden peas and natural flavorings.